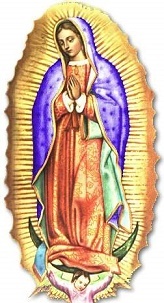 On December 9, 1531, in Mexico, Our Lady appeared to Juan Diego, a poor humble Aztec Indian who had recently converted to the Catholic faith. She asked him to go to the Bishop and tell him to build a church where she said “I will show and offer all of my love, my compassion, my help and my protection to my people.” Juan Diego did as she asked, but the Bishop asked for a sign that this message was really from Our Lady. Mary granted his request. On December 12, she showed Juan where the most beautiful Castilian roses were and told him to gather them. It was a miracle that the roses were there and in bloom because there was frost on the ground, and the ground was an infertile place where only cactus and thistles grew. After he gathered them, she helped arrange them in his tilma, or poncho, and told him to show them to the Bishop. When he brought them to the Bishop, the Bishop was amazed at the roses, but was even more amazed at what began to happen to Juan Diego’s tilma. Right before their very eyes, the image of Our Lady began to form on the cloth. The picture of Mary was beautiful and the Bishop fell to his knees. He had the church built at her request. The tilma is still intact after 470 years. The colors have not faded and the cloth has not deteriorated. It has been on display in the Basilica of Our Lady of Guadalupe for all this time. Thou didst promise to hearken to our supplications, to dry our tears and to give us consolation and relief. Never was it known that anyone who fled to thy protection, implored thy help, or sought thy intercession, either for the common welfare, or in personal anxieties, was left unaided. Inspired with this confidence, we fly unto thee, O Mary, ever Virgin Mother of the True God! Though grieving under the weight of our sins, we come to prostrate ourselves in thy august presence, certain that thou wilt deign to fulfill thy merciful promises. We are full of hope that, standing beneath thy shadow and protection, nothing will trouble or afflict us, nor need we fear illness, or misfortune, or any other sorrow. Thou hast decided to remain with us through thy admirable image, thou who art our Mother, our health and our life. Placing ourselves beneath thy maternal gaze and having recourse to thee in all our necessities we need do nothing more. O Holy Mother of God, despise not our petitions, but in thy mercy hear and answer us. (In gratitude for the four apparitions to Juan Diego and the one to Juan Bernardino).